I’ve been on a diet since the 4th grade, it seems like. I’ve tried tons of programs and fad diets and honestly, I lacked consistency. I wanted the get slim quick fix and there wasn’t one. Weight has stopped me from really going after the career I wanted (music). Instead of being the “artist”, I transitioned into just being a songwriter. I wrote and published a children’s book but, didn’t want to go out and promote it because of my weight…really?! I stopped dating and went into a shell. As a web developer, I just sat in my house and worked and didn’t allow anyone to really see me. It didn’t help that my mother had become ill and that also contributed to weight gain due to stress and hiding because she didn’t want to be seen either. I recently turned 30 years old and I realized that I’m in what should be “the best years of my life”! I decided to make the rest of my life, the best of my life. I’m getting this weight off of me and getting my life back. I have a lot to offer and I want the world to know! 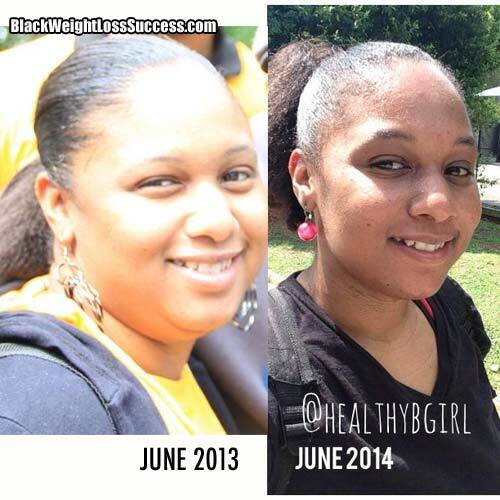 So, starting off at about 220 pounds (I’m 5’2″), I researched and decided to do a juice detox. I lost 21 pounds in 29 days in June of 2013. I gained all of it back by November. I didn’t continue to eat healthy but, it did teach me that I had it in me to do. Around January of this year I decided to get back to it. Unfortunately I got into a stressful situation that caused me to lose 22 pounds in an unhealthy manner (pretty much not eating). When that happened I was actually upset. People would think I’d be happy about the weight loss but, I knew that losing weight due to stress is not good. I turned things around by getting the stress off of me, eating healthy, and running. I’ve recently started working with a trainer as well. I’m currently 190 pounds and looking to be around 130 to 140 pounds. My main goal is to inspire others during this transition. I’m excited to be going through it and I feel stronger everyday. I’ve also started a bi-monthly fitcamp where I get women and young girls together to play fitness games, workout, meditate, talk, and eat some healthy foods. I want everyone to know that they can do it. You have to fight for your life. It’s a literal GET UP AND FIGHT type of battle! When you want it bad enough, you’ll have the ammunition to go through this war!! You look so much younger with the weight loss. 🙂 Congrats! I too am fighting the battle of the bulge. Your story has motivated me, thanks!